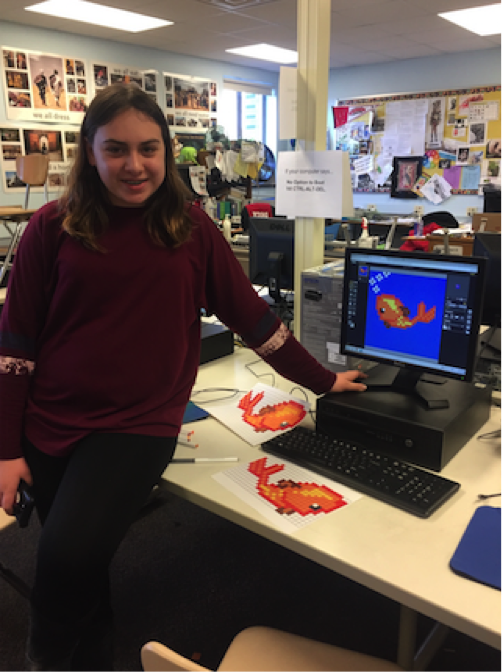 Sennett Middle School’s Gaming Club – Creating Game Art! At a recent game development club we hosted at Sennett Middle School, the Filament Games team introduced students to video game art, which is an important component of any video game’s development. There are many different artistic styles developers can choose from, but we chose a style that’s both iconic and easy to learn: pixel art. Pixel art was invented back in the ‘80s when interfaces for video game consoles were primitive and used screen resolutions that were much smaller than they are today. This early art form was designed pixel by pixel within a grid and didn’t take up much space so that early computer processors could quickly render them on a screen. Although pixel art has humble beginnings, it still remains one of the most popular artistic styles for video games – look no further than Owl Boy, a highly successful pixel art game that was released just last November. All images are made up of pixels, so any image can be zoomed in so that the pixels can be analyzed. Because of this, pixel art is a great starting point for students interested in learning about video game art styles. Our group of students ranged from grades 6 – 8, but this activity could be used across K-12. As we got started, students chose from a selection of example sprites that our team had printed out and digitally saved in a folder ahead of the event. This cut down time spent searching for examples and also provided templates that worked well for pixel art replication. For students who preferred to draw by hand, grid paper and color pencils were supplied and students began replicating their sprites within each printed box. Other students preferred to use Paint.net straight away on their computers and replicated the digital copy of their sprite to their working palette. There were also requests to draw their own interests, such as superheros or other video game characters. For this, we recommended that they search their character and “sprite,” “pixel art,” or “perler bead design.” For example, students searched “Mario pixel art sprite” or “Mario perler bead template” and came up with great examples, and both work well for the style. If students found their own images, we had them magnify their example art in their painting program or print their example at a larger scale so that they could easily see each pixel. Even though these students had not drawn pixel art before, most were able to complete their designs in less than an hour. Their results were incredible. Some students only completed paper or digital versions, but others created both. Interested in other K-12 game development activities the Filament Games team has facilitated in schools? Check out our game design activity from last month!